The first Volkswagen Golf GTI was released to the motoring public in 1976. Volkswagen originally intended to build just 5,000 of the Mk I GTIs. 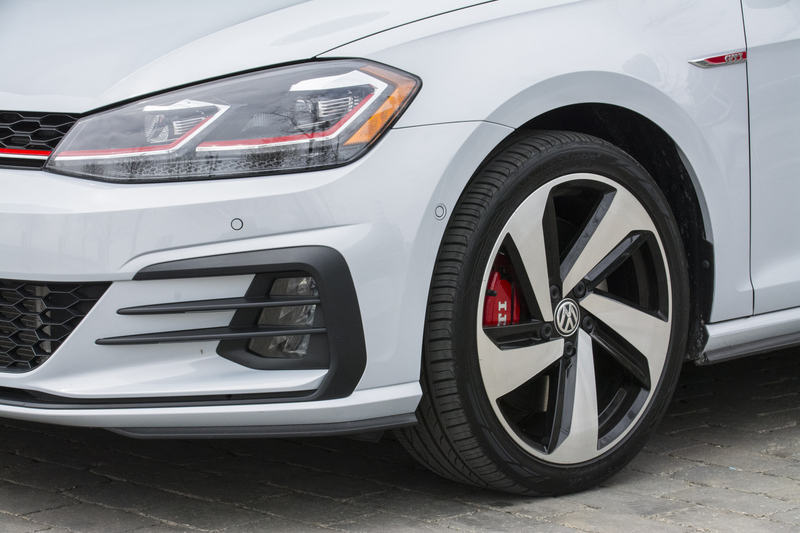 The 100 to 112 horsepower hot hatch was so well received that Volkswagen ended up building more than 462,000 GTIs over its seven-year run. Forty-two years later, more than 2 million of these iconic three- and five-door hatchbacks have been built and driven by motoring enthusiasts around the world. 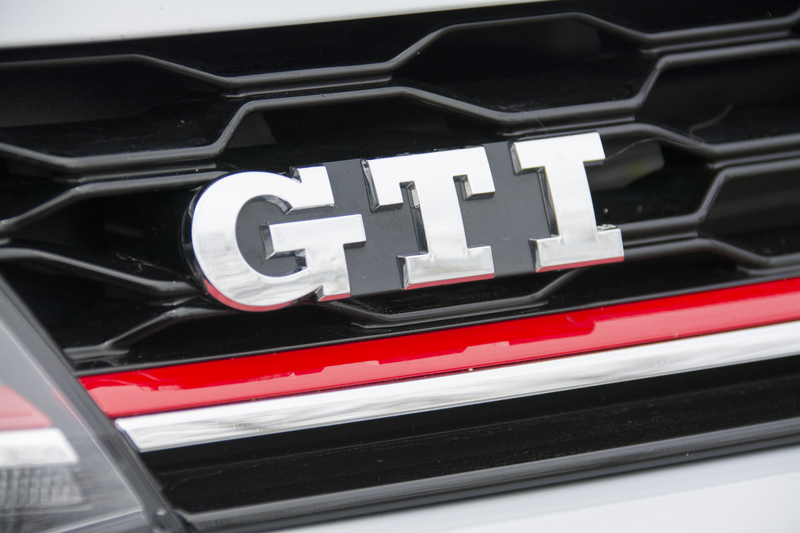 Over the past four decades the Golf and GTI variants have gone through a carefully orchestrated evolutionary process. 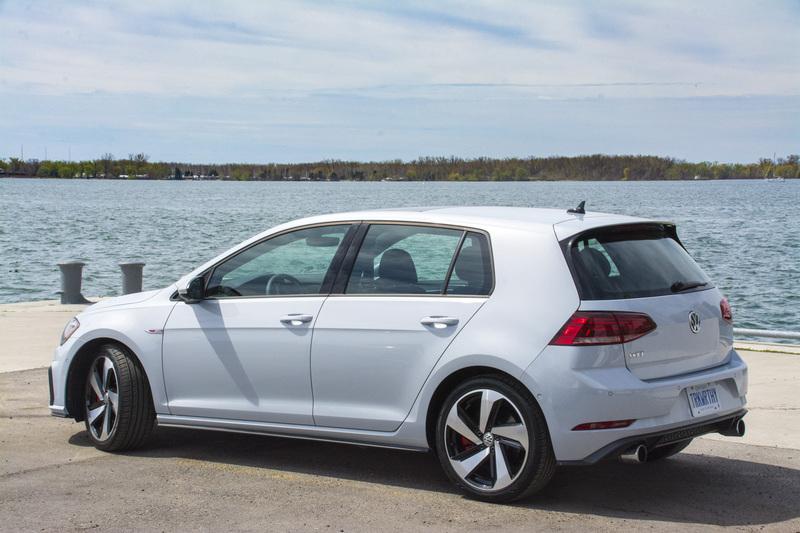 The 2018 Golf GTI is even better than our recent 2017 Golf GTI long-term test car, with interior and exterior tweaks. 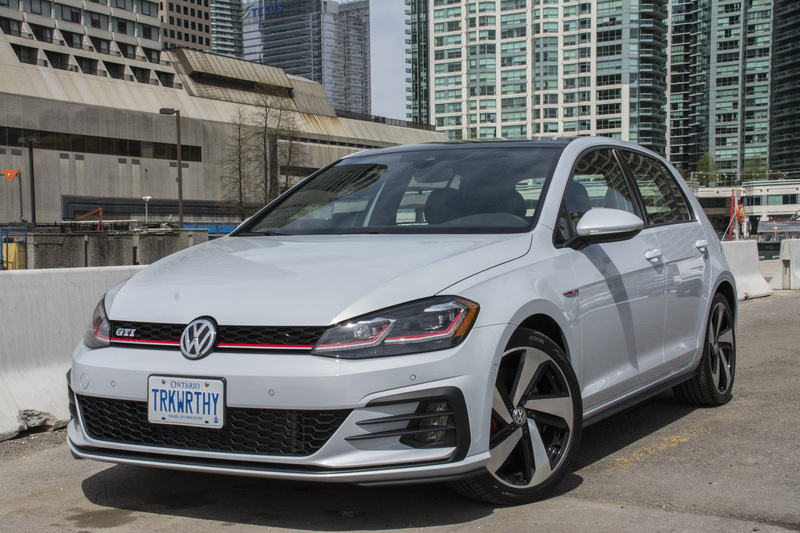 Our 2018 Golf GTI 5-Door Autobahn edition test car is equipped with the White Silver Metallic exterior (no-cost option), Clark Cloth interior (no-cost option) and the Driver Assistance Package ($1,750 option). 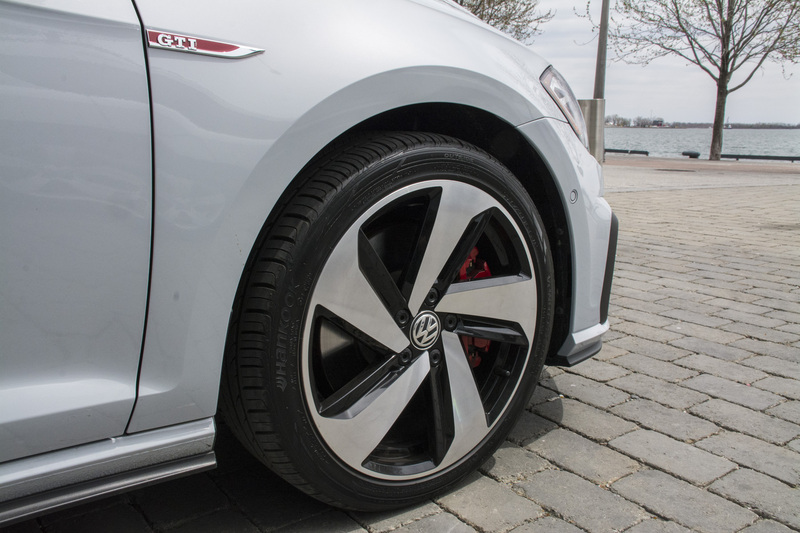 The base GTI starts at $30,595 with the 6-speed manual, or $31,995 with the optional 8-speed DSG transmission. 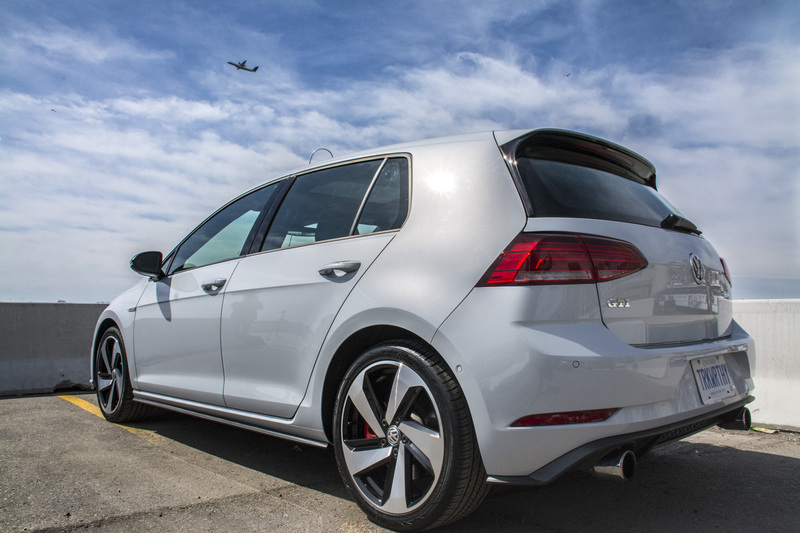 The base GTI Autobahn starts at $35,895 with the 6-speed manual, or $37,295 when equipped with the DSG. With the optional $1,750 Driver Assistance Package, our test car’s MSRP is $39,045 plus freight, PDI and taxes. 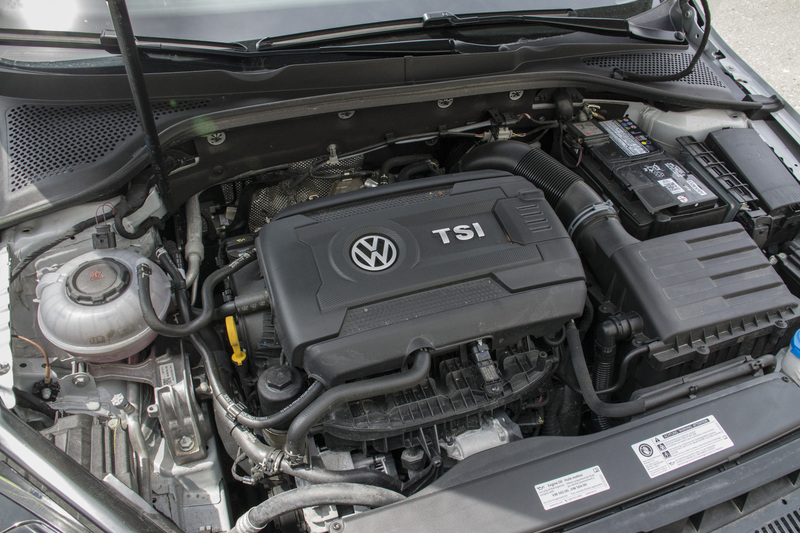 The 2.0 litre TSI intercooled turbocharged engine generates 220 horsepower at 4700 rpm and 258 lb-ft of torque at 1500 rpm. Our tester is fitted with the optional ($1,400) 6-speed automatic DSG with Tiptronic, which performs extremely well when mated to the very energetic and willing inline 4 cylinder engine. Manual shifting can be achieved using either the steering wheel mounted paddles or the gear shifter. 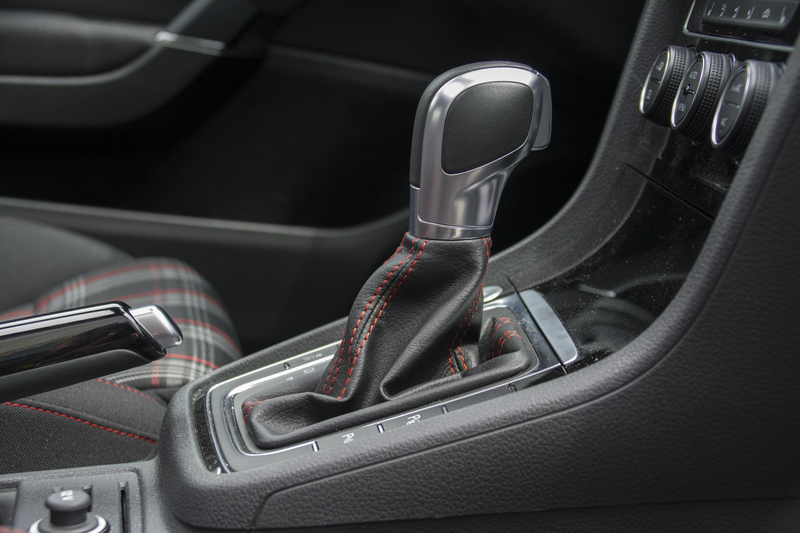 Gear changes with this dual clutch transmission are instantaneous – the transmission definitely adds to the performance driving characteristics of this car. 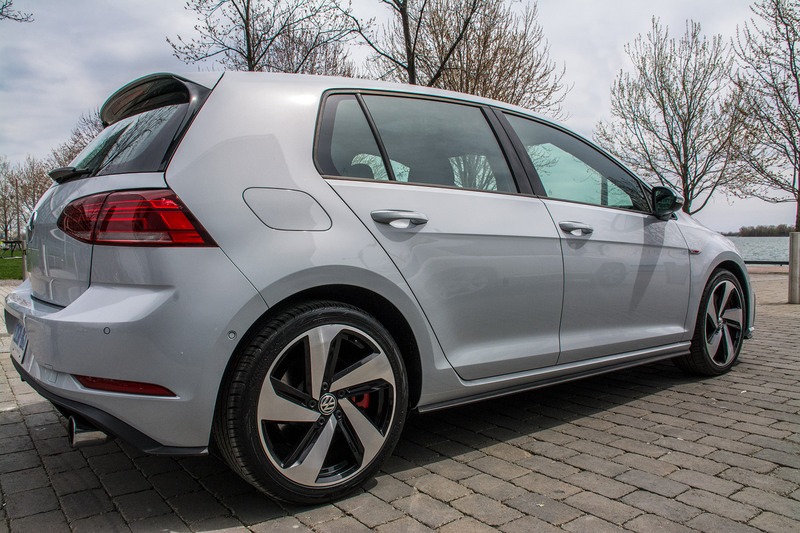 The GTI’s Sport Suspension is slightly stiffer and lower than those of the non-GTI Golf models. The Cross Differential System (XDS) works seamlessly and moves power to the outside wheel when cornering if the system anticipates wheel spin of the inside wheel. This car really does deliver quick, sporty and precise cornering. The DSG will out-accelerate the 6-speed manual by a few tenths of a second with both cars scampering from 0 to 100 km/h in the low to mid six second range. The most noticeable interior upgrade over our 2017 GTI is the Discover Media 8 inch touchscreen display with proximity sensor. 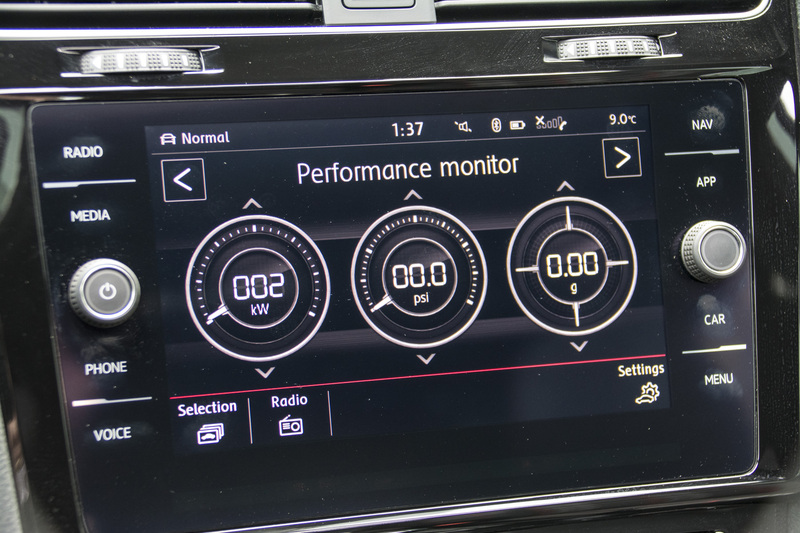 The head unit in the 2017 car worked very well, but the upgraded version in the 2018 GTI is bigger and better. It looks and operates with a real premium feel and intuitive functionality. It offers Apple CarPlay and Android Auto and the backup camera display is one of the best and most useful on the market today. We really enjoyed playing with the Think Blue Trainer. 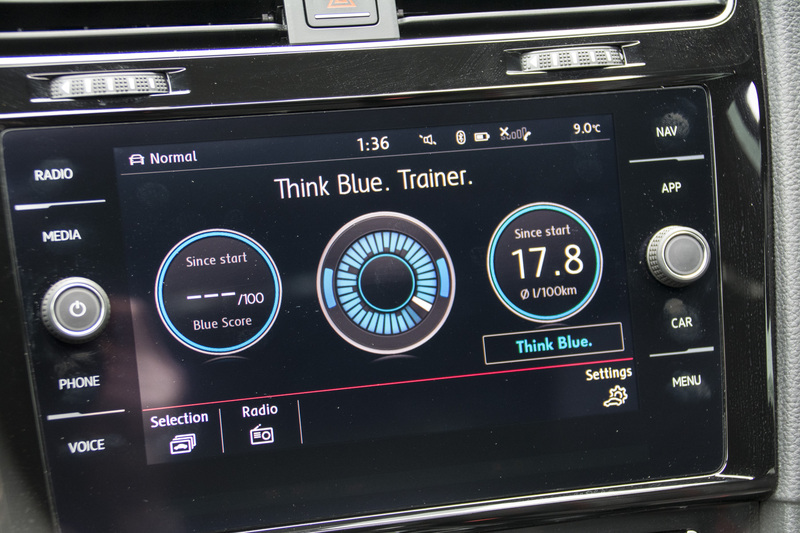 When activated, it displays the drivers score out of one-hundred, and a large blue circular dial indicates how fuel efficiently you are operating the car. 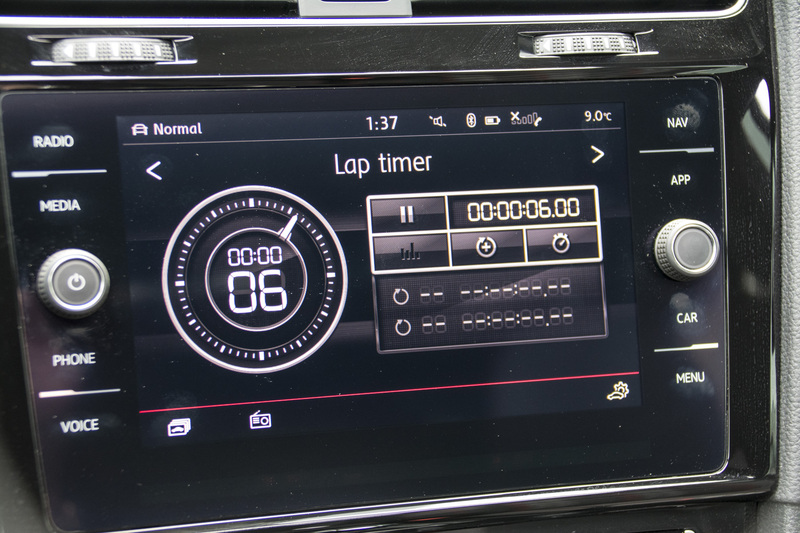 It is fun to monitor your score, but when you are tired of driving efficiently, switch the driving mode to Sport, put your foot down, and off you go. Our car was equipped with the optional Driver Assistance Package ($1,750), which includes Adaptive Cruise Control, Blind Spot Detection with Rear Traffic Alert and Lane Assist, Front Assist Autonomous Emergency Braking with pedestrian monitoring, Light Assist (Automatic high beam control) and Park Assist. The Adaptive Cruise Control works extremely well. When activated, the car will keep a safe distance from the vehicle in front and, when needed, based on traffic flow, it will bring the car to a complete stop, all without any driver intervention. It is a little unnerving the first time you try it, but once you are confident that it will take care of the car’s speed, it is a very effective driver aid. And your feet need never touch the pedals (but be prepared at all times to intervene and pay attention to traffic conditions). We’re not sure if it is the result of result of clever German engineering, forty years of evolution, or just the overall shape of the car, but we love how quiet the cabin is with the sunroof and windows wide-open. Not only is the sunroof large and far enough forward that you can actually see out of it while driving, cruising at speeds of up to 100 km/h with the sunroof open and windows down is a pleasure and doesn’t feel like you are standing on the wing of an airplane, as is the case with other cars. As a kid being hauled around in the family station wagon, we listened to the radio out of a single centrally-mounted speak. The first used car I owned when attending university had two speakers. 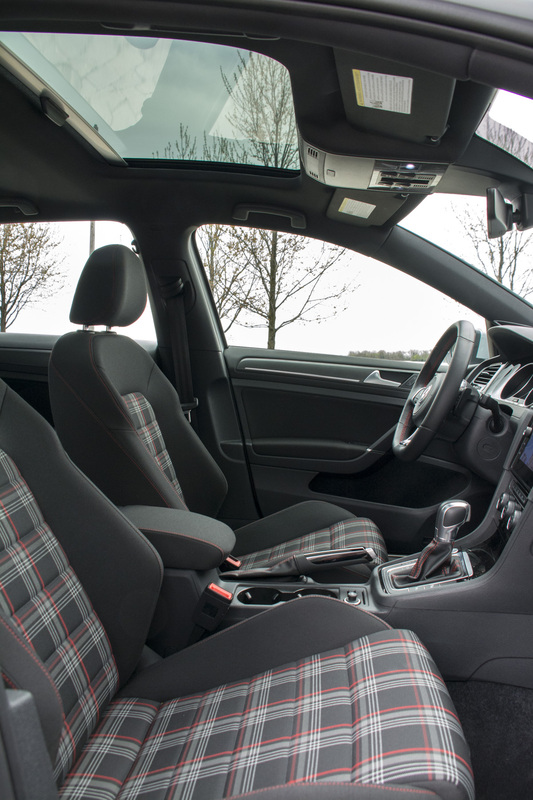 Our 2018 GTI is equipped with a Fender Premium audio system that has eight speakers, plus a subwoofer, and four-hundred watts of power. It makes the music sound great and the augmented engine noise sound great too. You especially notice this when the car is in Sport mode. We prefer old fashioned real engine noise, but we will take it in augmented form too. After recently spending 18 months with our 2017 Golf GTI and one week with the 2018 Golf GTI, it is no wonder that this is one of the most praised, loved and popular hot hatches in the world. 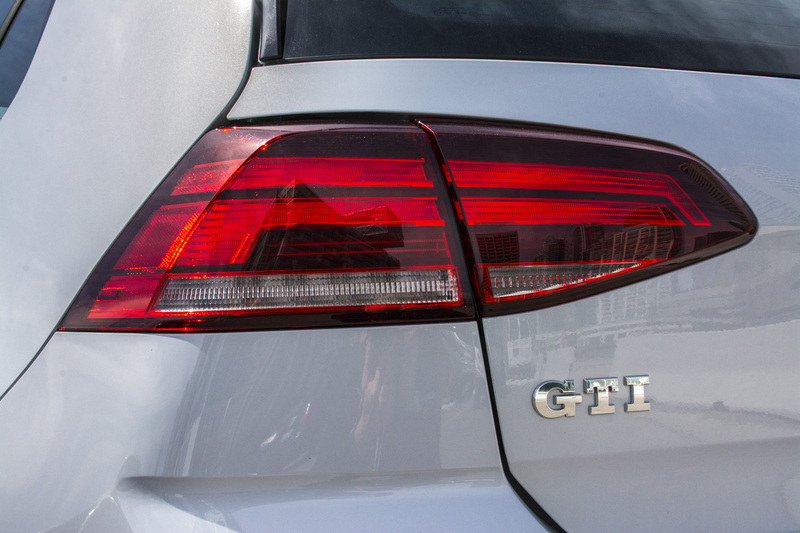 The Golf GTI delivers driving performance and refinement at segment-leading levels. 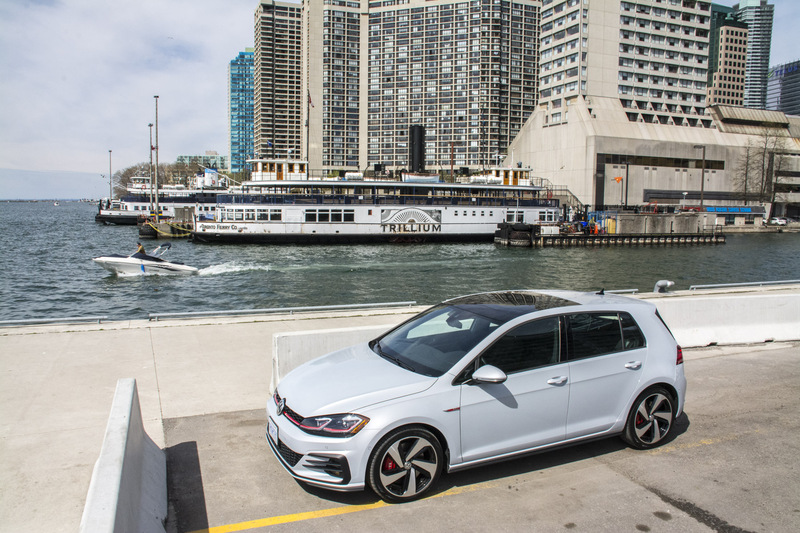 The inevitable question arises, however: with a price as tested of $39,045 should one spend the extra few thousand dollars and upgrade to the all-wheel drive Golf R at $42,065 with the 6-speed manual, or $43,465 with the DSG? The GTI and R are very different cars. 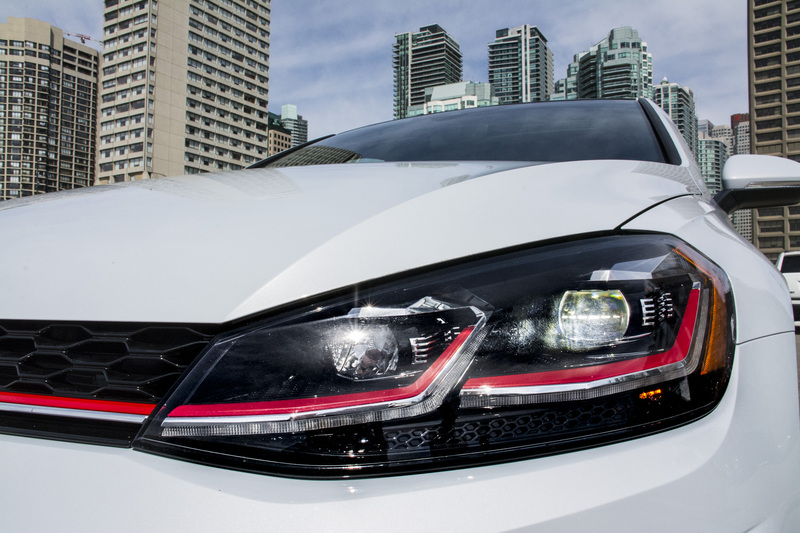 The GTI is a fantastic and refined all around versatile performance car. 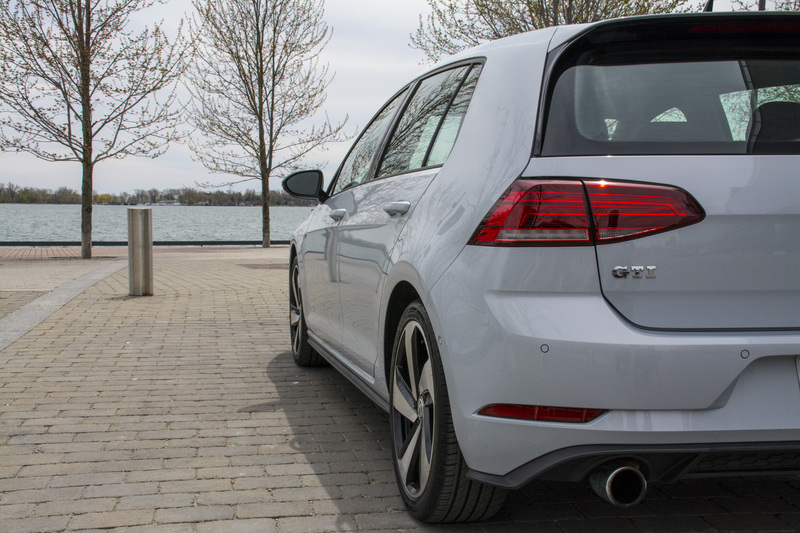 The Golf R is a much more aggressive, higher performance hot hatch. In addition to the performance differences, the Golf R is not available with a sunroof, which is important to some buyers. The only way to find out which is best for you is to try both. You cannot go wrong choosing a GTI. It is a joy to own. PHOTOGRAPHS BY MICHAEL TAYLOR © COPYRIGHT 2018 TRACKWORTHY GROUP LTD.